Extra tent $10.50 per night - An extra 4-man tent is allowed on an RV site with the RV (space permitting). Please register upon arrival. We do require a credit card to hold your reservation and require 48 hours notice for cancellations or date changes. If you fail to notify us within 48 hours that you will not be staying we will charge your credit card the cancellation fee, which is $40.00 per site. We do require a 2-night minimum for weekend stays and a 3-night minimum for long weekend stays. 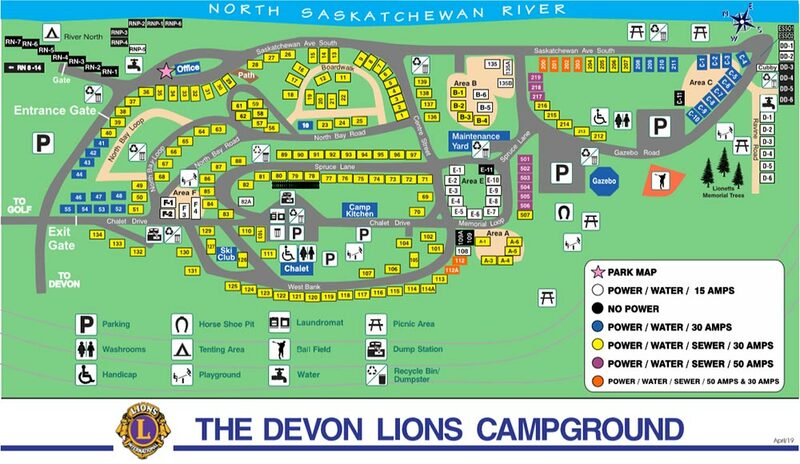 The Devon Lions Campground is a peaceful tranquil getaway nestled in the North Saskatchewan River Valley. Please treat it with the respect it deserves. Mistreatment of the park wildlife, willful or careless damage to park property, trees, etc. will not be tolerated and charges will be laid. All patrons enter the campground at their own risk. Please use caution when enjoying the North Saskatchewan River. The Devon Lions Campground is a cannabis free zone. Smoking and/or vaping cannabis is prohibited within the campground. Click here to view the full park rules and regulations. Click here to view a large PDF version of the campground site map.